Patriarch Kirill of Moscow and All Russia. 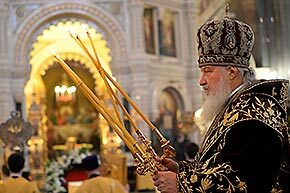 Patriarch Kirill of Moscow and All Russia will take a tour of countries in Latin America on February 11-22. The patriarch is expected to visit Cuba, Paraguay and Brazil, Metropolitan of Volokolamsk Hilarion, the head of the synodal department of external church relations, said at a press conference in Moscow on Feb. 5. The first point of the program will be the visit to Cuba at the invitation of Raul Castro, the head of Cuba's State Council. The metropolitan recalled that Patriarch Kirill had visited Cuba back when he was a metropolitan, and had met with the Cuban administration. He supervised the construction of a Russian church in Havana and he sanctified that church. In previous years, Raul Castro had invited Patriarch Kirill to visit Cuba many times, but the visit was delayed due to the patriarch's visits to the dioceses of the Russian church in the CIS countries and other Orthodox churches. The visit to Cuba was timed to the 45th anniversary of the sanctification of the first church of the Moscow patriarchate in Havana. The Russian-speaking community of Cuba, which has 15,000 members, "is looking forward to the patriarch's visit," Metropolitan Hilarion said. The patriarch has planned a meeting with Fidel Castro and Raul Castro, a visit to a children's rehabilitation center, and a liturgy in the church in honor of the Iron of Our Lady of Kazan in Havana. Patriarch Kirill will also visit Paraguay at the invitation of the administration of the country. The visit to Brazil is timed to the 95th anniversary of the arrival of 1,217 Russian refugees from Gallipoli in Rio de Janeiro and also the 70th anniversary of the creation of the Argentinean and South American dioceses of the Russian church. The patriarch will visit the capital, where he will meet with the country's president, and then he will visit Rio de Janeiro, where he will conduct a prayer service on Mount Corcovado, at the famous statute of Christ, will visit the Russian church and will meet with the local catholic cardinal. He will also lead a liturgy in the St. Paul's Cathedral of the Antioch patriarchate.